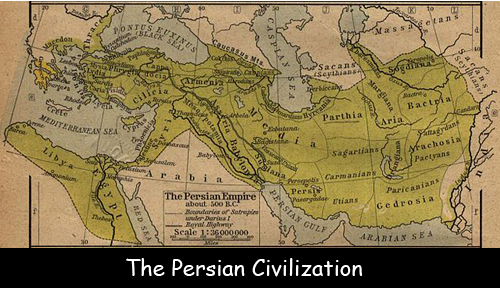 The Persian Civilization was one the largest civilizations the world has ever seen. It started as a collection of semi-nomadic tribes. They raised goats, sheep and cattle on the Iranian Plateau. This empire was founded by Cyrus the Great in 550 BCE. Cyrus was a leader of one of those semi-nomadic tribes. They first took control of the Middle East after the Decline of the Babylonian Empire. The Persian Empire is also known as the Achaemenid Empire. They created the World’s first ever human rights charter. In the Persian Civilization, a technology known as Yakhchals was invented. It was quite helpful in preserving foods. Persian people are also credited with building the earliest known verticals axis windmills for grinding grain and pumping water. They were the first people to establish the regular routes of communication between different continents. Cyrus the Great allowed the people to speak their own languages and practice their own religions after being conquered. Many new roads were constructed during the Persian Civilization and also the world’s first postal service was developed. The Capital city of the Persian Empire was Persepolis which is situated in present day Southern Iran. It is also one of the world’s greatest archaeological sites and was designated as a UNESCO World Heritage site in 1979. This empire started declining in 480 BCE after a failed invasion of Greece made by Xerxes I.
Declan, Tobin. " Facts for Kids about The Persian Civilization ." Easy Science for Kids, Apr 2019. Web. 18 Apr 2019. < https://easyscienceforkids.com/the-persian-civilization/ >.